The West Village has long been one of Manhattan’s hippest hoods. So it’s surprising when somehow there’s yet another underdeveloped nook within the leafy, cobble-stoned neighborhood that hasn’t been revived or re-revived. In this case, it’s the resurrection of a Romanesque Revival dockside warehouse. Erected in the 1800s and now rising in its second coming is a redbrick and granite 38-apartment residence (with three penthouses) aptly named The Shephard. 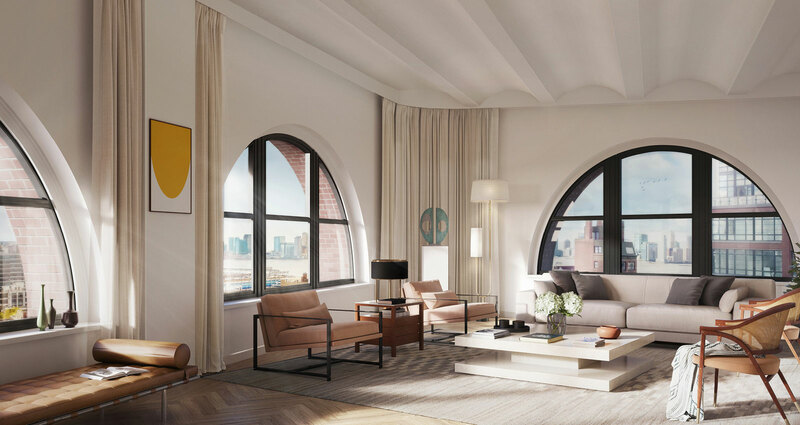 Naftali Group are the developers, Beyer Blinder Belle the restoration architects, and husband-and-wife design team John and Christine Gachot of Gachot Studios are breathing cozy, contemporary warmth into the interiors. We chatted with Christine about the project and the increasing accessibility of the design world. Where does The Shephard fall within your design sensibility? I designed it for my family and me, even though I don’t live there. I really inserted myself into the project and pretended that I lived there. My dream is to take a classic Carnegie apartment and throw it downtown. That’s kind of what we did. You walk in and have a proper foyer and closet. There’s a place to put your keys. It’s like Woody Allen’s Hannah and Her Sisters, where there are proper rooms and people doing what the rooms are designed for—someone playing the piano in the music room, and so on. In true American spirit, you don’t seem afraid of consumer accessibility. People didn’t used to talk about interior brands like Knoll, Greta Grossman, Eero Saarinen. I like when my clients are aware of trends—brands like Ikea, Crate & Barrel and Design Within Reach have familiarized design language, like within the fashion industry.